There aren’t many lines of non-licensed fantasy action figures the market. Most companies make Lord Of The Rings or Legend Of Zelda figures. Recently I got an itch to do more fantasy/medieval photos, so I took stock of my collection. In LEGO minifigure form, I have a small, but well rounded collection. But in action figure form, I have zilch. Nada. Nothing. Star Wars, Marvel and Pacific Rim were represented in my minuscule lineup, but nothing medieval fantasy. I had the all-knowing Google to tell me where the good fantasy figures were to be found…or so I thought. After long research of LOTR figures, I realized I wanted something more generic. Something similar to Lego’s Fantasy Era Castle theme. Don’t get me wrong, I love LOTR but there is already a story there that you have to work around when shooting them. I wanted a line with minimal story that contained knights, trolls, skeletons, dwarves, etc. So I Googled it. Nothing. I tried some different keywords. 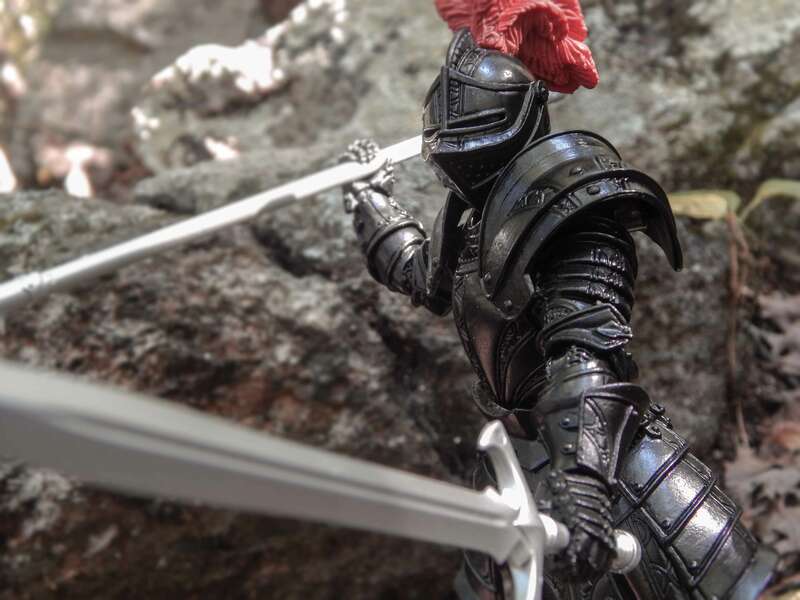 A pair of incredibly expensive 12” knights pop up. That’s it. Those are the only figures in that line. I despaired of finding any fantasy action figures and turned my attention to my newest figure: the S.H.Figuarts Iron Man MK 50. But alas! It was defective and had to be returned. So I sent it back, waited a few weeks for the package to arrive…only to find that Figuarts forgot a large amount of paint on Iron Man’s crotchal region. Now, I don’t cuss, but that certainly made me feel like it. I refrained, however, and sent it back in return for Big Bad Toy Store (BBTS) store credit. Around this same time I saw Jon Jansen Campos’ picture ‘An Army Of One’ on G+. 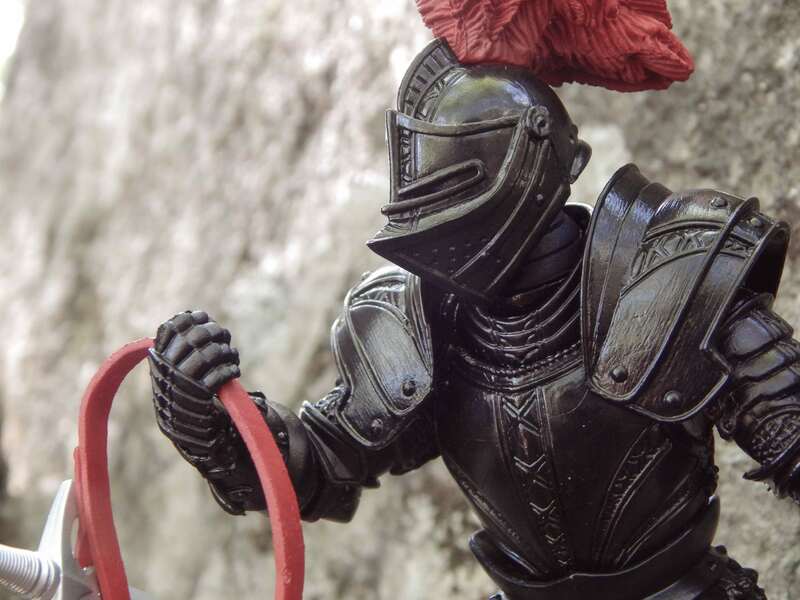 The knights in the fore-and-background interested me, so I asked if they were posable figures and he told me about Mythic Legions, a fantasy action figure line that had knights, trolls, skeletons, dwarves and a bunch of weird bird-men with spears. It was exactly what I was looking for! 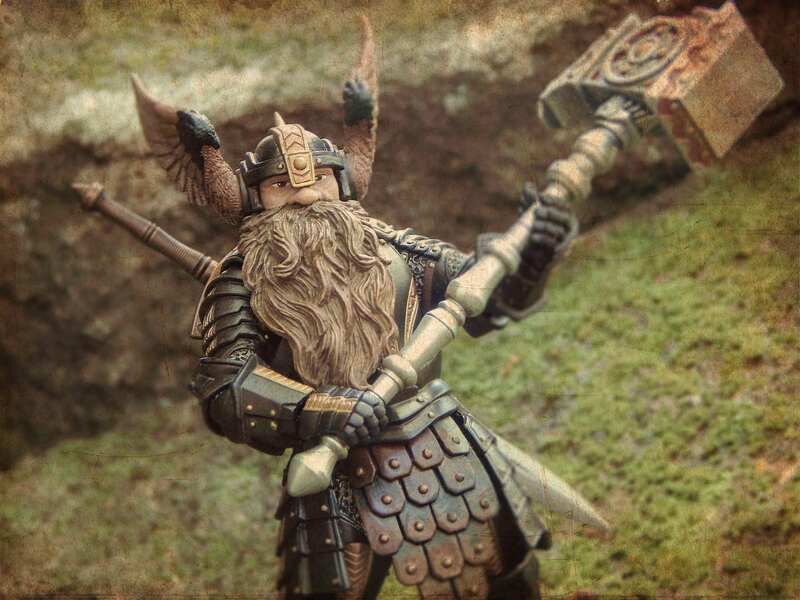 Using my BBTS credit, I snagged Halmyr Goldentooth, a dwarvish gladiator and a Black Knight Legion Builder, a guardian of the Mercurian Coliseum. After my bad experience with Figures, I’m extra alert for flaws. Let’s see if these figures live of to their hype. 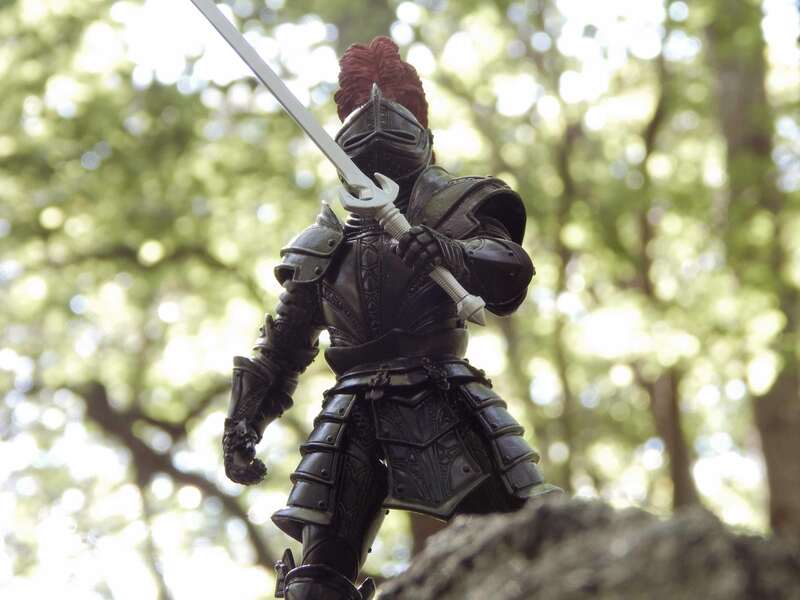 Each Mythic Legions figure comes in a large blister-pack-esque box with some very detailed art and short bios. I don’t care all that much about the boxes themselves but the bios are actually really cool. First is the bio for the line as a whole, which is far too long for me to copy down here. Second is a bio for that specific character. The Black Knight didn’t have one since he’s a generic Legion Builder. Halmyr Goldentooth had one though, and it’s one I quite like. Excellent! Excellent, excellent, excellent! So much background, yet still so much room for your own stories. Fantastic! Both figures come with some awesome accessories. 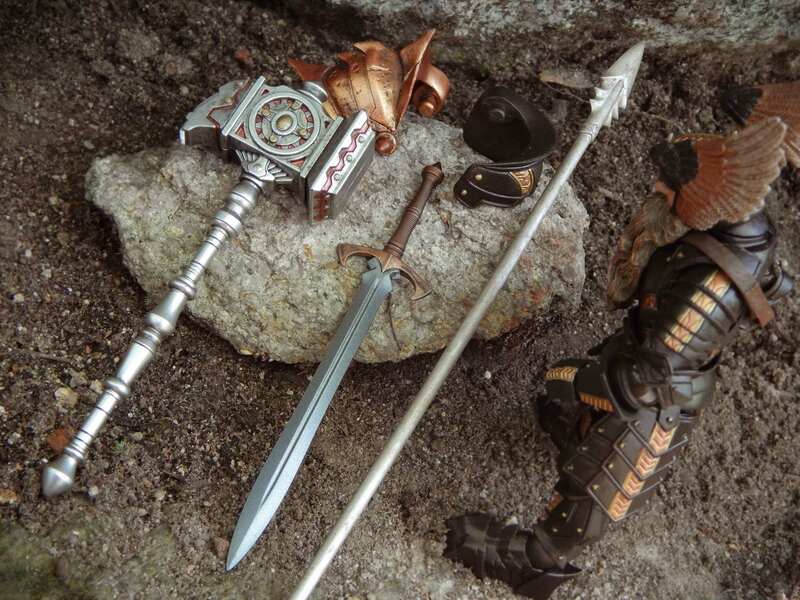 The war hammer has removable parts for customization, if you purchase additional pieces. 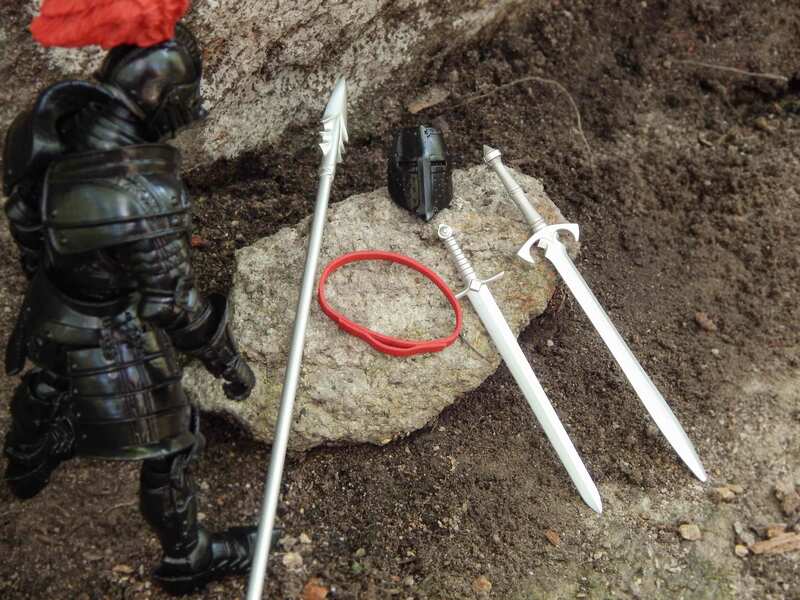 The belts have a loop to hold a sword (or a dagger, though none are included with these figures). The belt can be slung over a shoulder by removing the figure’s head and slipping it on. You can also put it around their waist. There weren’t any instructions whatsoever, so I had to Google a figure breakdown to see how to accomplish this. You basically just pull them in half at the waist. More about that later. The shoulder armor can attach via pegs that fit into holes on the figure’s upper back, allowing the armor some movement. It doesn’t restrict much of the Black Knight’s movement, but Halmyr’s head has no space to move at all with his shoulder armor on. All the weapons slot into the figure’s hands nicely. Since the hands are a softer plastic, they can stretch out sometimes. It’s fairly easy to bend them back though. Moving on to the figures themselves. 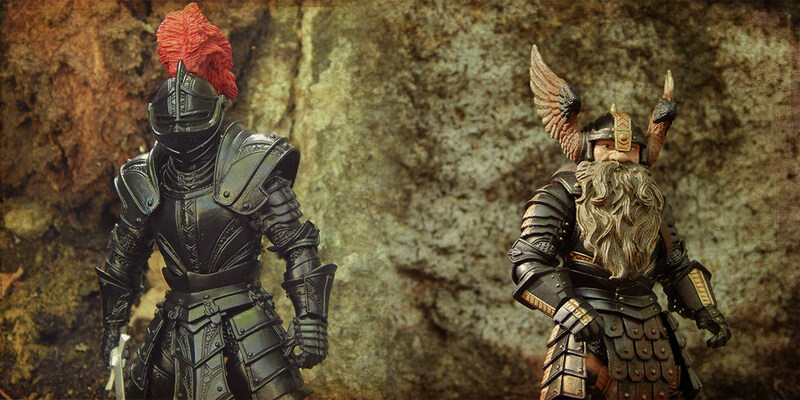 The sculpting work on both figures is gorgeous. The Black Knight, being a Legion Builder, has less paint than Halmyr but the superb sculpt more than makes up for that. There’s everything from artistic details on almost all parts of the armor: from chainmail to little rivets here and there. All beautifully sculpted. You’ll see different details depending on where the light hits, ensuring that this figure will never be a bore to shoot. The paint is great even if it is just black with a little red for the plume. Halmyr is where the paint really comes into play though. I can’t even begin to describe it all. You really just have to see it. A few standouts for me were the bronze shoulder armor, the epic sweeping eagle wings on the helmet (with are actually removable) and Halmyr’s face and beard. Especially the face and beard. The beard is so well sculpted and painted, it doesn’t instantly show up screaming “I’m plastic!” in photos. The face, or more importantly, the eyes, can make or break an action figure. Too many affordable figures have blank eyes, or weirdly crossed eyes or some other flaw that makes them look dumb on- camera. Not so for Halmyr. His eyes have excellent depth and realism. You can practically see the memories of his tragic past flashing by behind them. As for paint flaws, I haven’t really found any on the Black Knight. Halmyr’s elbow joints seem to have had the paint applied too thin or something and it rubbed off, but it’s in the joint and it only shows up in certain lighting and angles. For big bulky dudes in armor, these guys have plenty of movement. In fact, there are too many joints for me to list, so I’ll tell you where they’re limited. The arms on both figures can’t lay flat against their sides. The arms will always be out just a little. The shoulder armor, as I mentioned before, limits Halmyr’s head. Both figures can’t reach across their torso, so they can’t hold a sword in both hands. Halmyr’s head is vaguely restricted by his beard when he’s not wearing the shoulder armor. And…yeah, that’s about it. Fiddling can get the figures into a wide range of poses. Both figures balance fairly well, especially Halmyr with his big spiny boots. In terms of joint friction/stiffness, both figures are pretty good all around. They hold the pose you put them into and don’t flop around. A few joints were a bit stuck right out of the box, but they unstuck easily. Halmyr’s waist joint was a bit loose and made him flop back and forth when he was more horizontal, so I popped him in half to see what the problem was and that made it worse. Three small strips of masking tape fixed the issue, but I’m now wary of dismantling these figures for customization. Since they’re a heavy softer plastic, I don’t see how they would hold together after a few times of pulling pieces off and putting them back on. 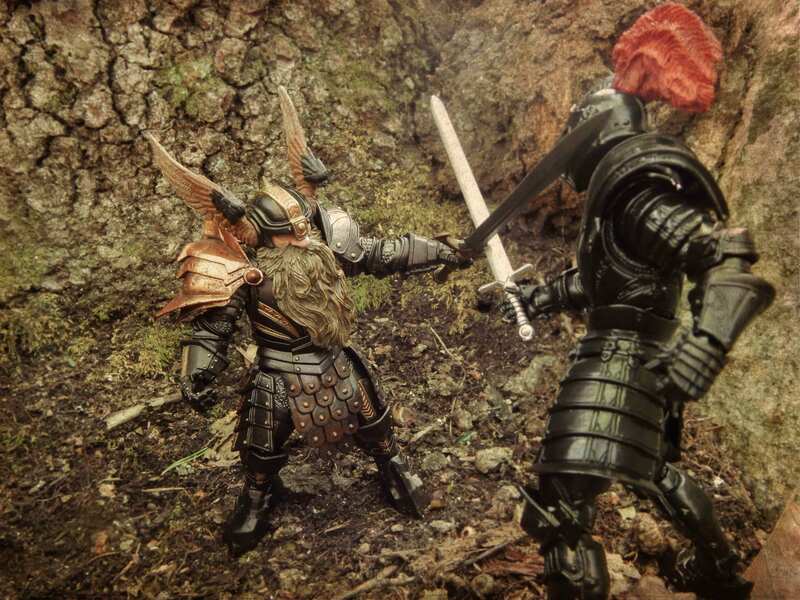 There are Mythic Legions knight builder kits, so maybe I’ll get one of those at some point to see how well the figures hold up to customizing. The fact that there are no instructions is a downer. If I hadn’t found that breakdown picture, I would have no idea what comes off and what doesn’t. In the end I’m glad I returned the Figuarts Iron Man. Where I live, I have more access to woods and rocks that are better suited for photographing fantasy figures than Iron Man. Only time will tell how these figures hold up to frequent posing and shooting. If you’re like me and want to try something other than Marvel or Star Wars, I suggest you give this line a try. They’re a little bit of a mixed bag, what with the modular system seeming a little iffy, but they look so amazing. 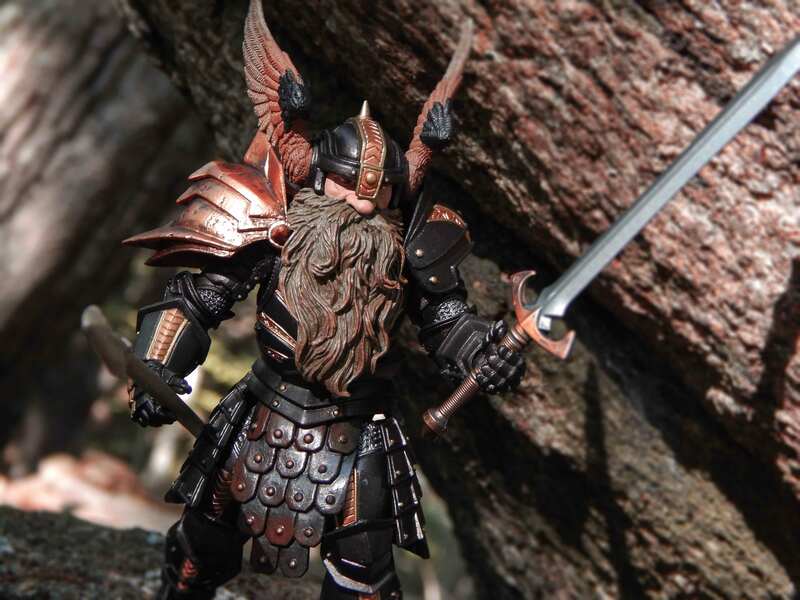 Disclaimer: each wave of Mythic Legions figures has a very, very limited run. Aftermarket prices are extremely high and collecting these figures is a very slippery slope. I cannot be responsible for pushing you to bankruptcy with this review, but…you should really check them out. You can find them at Big Bad Toy Store or directly at Four Horseman Studios. Nice reviews! They have such great sculpts and details. I’d preordered the elf ranger from the ?last wave for similar reasons of wanting a unique character that’s not tied in necessarily to LOTR. The customisability and compatibility parts are such cool features. Looking forward to finally seeing one in hand come December ETA! If was not for the ridiculous shipping cost, i would have a lot of those figures from 4 horsemen. Really great figures! BBTS shipping is very good. They have a $4 flat rate, so the shipping for my two figures was just $4. These look so fun! And so many options coming out soon. Thanks for this review, really helpful!